The key to the UK becoming a world leader in innovation is to forge closer links between industry and higher education, says the government. A White Paper outlines the government's vision for the UK to become an "innovation nation". A range of initiatives is intended to help small businesses to link up with universities and colleges to develop new products and services. Conservative critics say the proposals are too little too late. The Innovation Nation White Paper sets out how businesses and people in the UK are best placed to benefit from the new opportunities and prosperity created by the demand for innovation. Launching the document the Secretary of State for Innovation, Universities and Skills, John Denham, said: "We must make the UK the best place in the world to run an innovative business or public service, where innovation can flourish across every area of the economy. "It is the British people who will create a world beating innovation nation and that is why we must unlock talent at all levels by investing in skills, research and the exploitation of knowledge." The strategy is the first to focus on innovation policy since the creation of the Department for Innovation, Universities and Skills (Dius) and addresses some of the themes raised by Lord Sainsbury in his review of the government's science and innovation policies in October 2007. The shadow secretary of state David Willetts said the measures were a step in the right direction, but would only scratch the surface of the skills shortage. He said: "The Sainsbury Review was an indictment of government failure on innovation and this White Paper is an open admission of guilt. These belated announcements are useful, but they fail to rise to the scale of the challenge. "The government still hasn't resolved issues around intellectual property or the skills gap in the economy. "Meanwhile, ministers have been raiding departmental R&D (research and development) budgets to plug gaps in the public finances." The Association for Science Education welcomed the White Paper, but said innovation was being stifled in school science lessons. The association's Alan Rhodes said: "Our curriculum is so test orientated that children are being taught to pass tests and you do not innovate when teaching children to pass tests. "I believe in high standards, but there is insufficient time for creativity in the curriculum from primary school up to the age of 18." Mr Rhodes heaps praise on the Nuffield Foundation for its "innovative" approach in forging partnerships between education and industry. The Foundation provides independent funding for research and development in education, law, science and social policy. It runs two bursary schemes - one for first-year A-level and Highers students following a science, technology, engineering or maths (Stem) course. 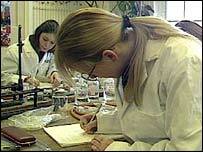 The other scheme is for second-year undergraduates considering scientific research as a career. The bursaries help fund a summer holiday placement for A-level students and for undergraduates the chance to take part in a defined research project for six to eight weeks of the summer vacation. Many of the companies taking part, including GlaxoSmithKline, Cancer Research UK and Qinetiq, have gone on to offer students a full-time job after completing their course. Nuffield Foundation bursary scheme national co-ordinator Sharmila Banerjee said the aim was to support young scientists, technologists, engineers and mathematicians in their Stem careers. "What our partners are providing is a unique insight into industry and other areas where Stem knowledge is required. "These partnerships offer the experiences and skills development young people need to innovate and become future researchers and scientists to ensure that the UK remains at the forefront of scientific and technological advancement. "Everyone is aware that we have a skills shortage and that's why it's important to forge these skills partnerships." New boom-time for British tech?